Researchers have devised a nanoscale sensor to electronically read the sequence of a single DNA molecule, a technique that is fast and inexpensive and could make DNA sequencing widely available. The technique could lead to affordable personalized medicine, potentially revealing predispositions for afflictions such as cancer, diabetes or addiction. The researchers previously reported creating the nanopore by genetically engineering a protein pore from a mycobacterium. The nanopore, from Mycobacterium smegmatis porin A, has an opening 1 billionth of a meter in size, just large enough for a single DNA strand to pass through. To make it work as a reader, the nanopore was placed in a membrane surrounded by potassium-chloride solution, with a small voltage applied to create an ion current flowing through the nanopore. 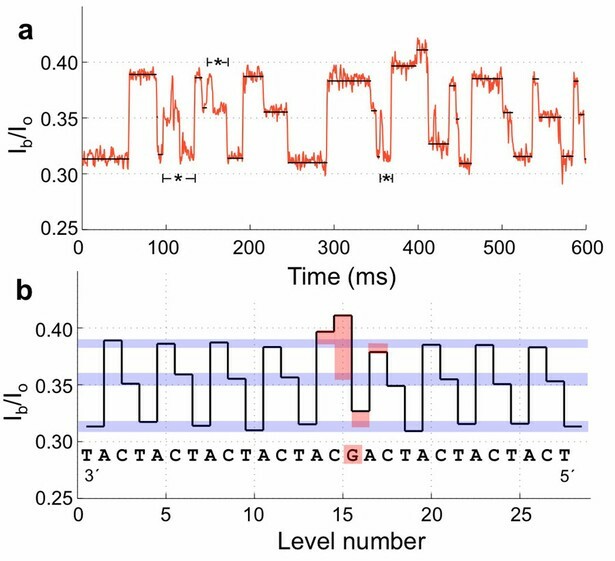 The electrical signature changes depending on the type of nucleotide traveling through the nanopore. Each type of DNA nucleotide — cytosine, guanine, adenine and thymine — produces a distinctive signature. The researchers attached a molecular motor, taken from an enzyme associated with replication of a virus, to pull the DNA strand through the nanopore reader. The motor was first used in a similar effort by researchers at the University of California, Santa Cruz, but they used a different pore that could not distinguish the different nucleotide types. Gundlach is the corresponding author of a paper published online March 25 by Nature Biotechnology that reports a successful demonstration of the new technique using six different strands of DNA. The results corresponded to the already known DNA sequence of the strands, which had readable regions 42 to 53 nucleotides long. “The motor pulls the strand through the pore at a manageable speed of tens of milliseconds per nucleotide, which is slow enough to be able to read the current signal,” Gundlach said. Gundlach said the nanopore technique also can be used to identify how DNA is modified in a given individual. Such modifications, referred to as epigenetic DNA modifications, take place as chemical reactions within cells and are underlying causes of various conditions. Coauthors of the Nature Biotechnology paper are Elizabeth Manrao, Ian Derrington, Andrew Laszlo, Kyle Langford, Matthew Hopper and Nathaniel Gillgren of the UW, and Mikhail Pavlenok and Michael Niederweis of the University of Alabama at Birmingham.